I’ll admit before trying this recipe at home, I made tempura using the batter mixes from a box. It never tasted like what I’m used to at Japanese restaurants so I haven’t tried it again since. 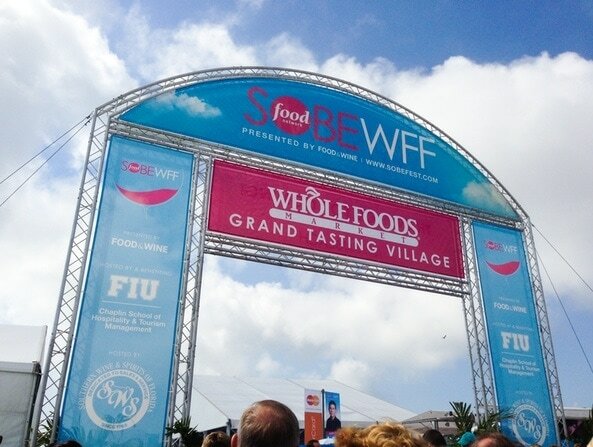 A couple of months ago, KitchenAid invited me to attend the South Beach Wine and Food Festival. I was so excited when they asked if I wanted to attend, it’s an event they are a big sponsor of. And can you believe I have never been to Miami and I live in Florida? I jumped at the chance to attend the festival and go to Miami for the first time. When I first arrived, I was trying to figure out where the entrance was. You see, this wine & food festival was on the beach! Then, I saw Ashley. I had met her last year at Food Blog Forum and she is as sweet as can be. I ended up hanging out with her, her husband and her friends. They are hilarious and so fun! Then, we happened upon this huge sign and we became so excited! 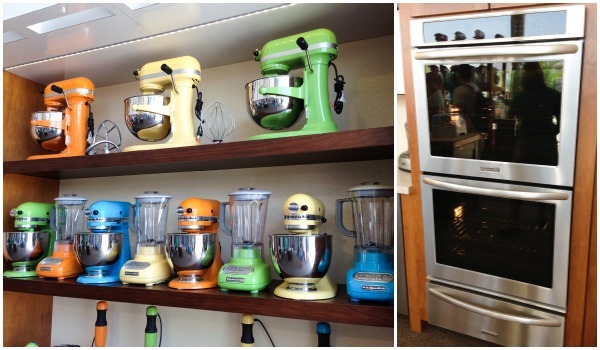 I was oohing and ahhing over the KitchenAid appliances. Aren’t those colors so fun??? I can’t choose a favorite — love them all! And those wall ovens, I wish wish my kitchen wasn’t so small so I could have KitchenAid wall ovens! 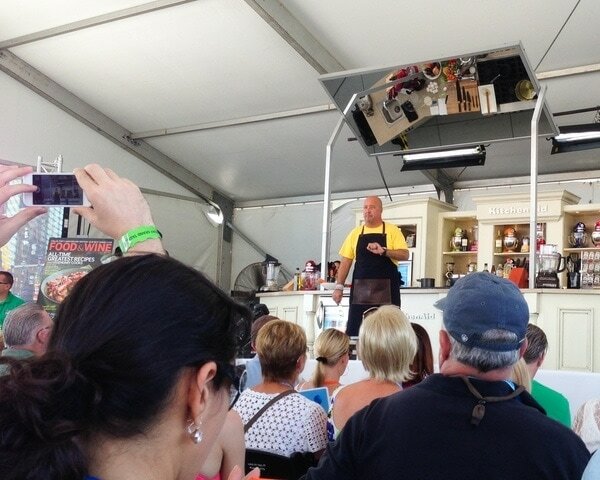 It was Andrew Zimmern who showed us how to make tempura and showed us how EASY it is to make over at the KitchenAid demo stage. He talked about how tempura is actually Portuguese not originally from Japan like everyone thinks. And I love this quote from him: “food is delicious but food with a story is even more delicious”. I also saw cooking demos from Robert Irvine who I learned about grape seed oil from and Chef Michael Symon. And then I proceeded to eat and eat and eat. 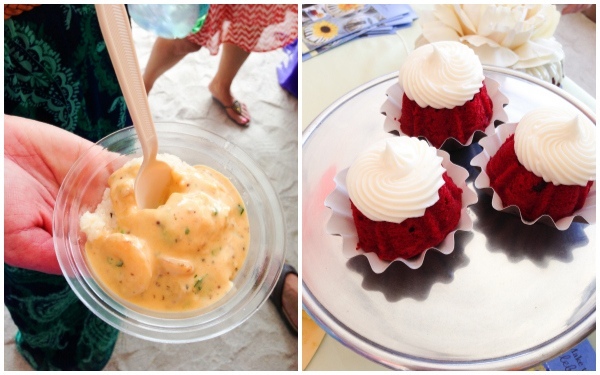 My favorites in the grand tasting tent were shrimp & grits and red velvet cakes! 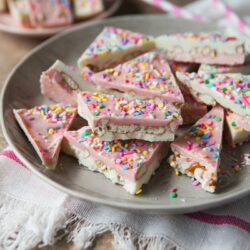 This recipe is pure genius and so easy! Andrew talked about the importance of a cold batter — so he uses ice water and only makes the batter a little bit at a time. If you need more batter, then you make more. And he uses cake flour!! And you want lumpy batter, lumpy is good. I set up a little station of veggies and shrimp all ready and prepped. 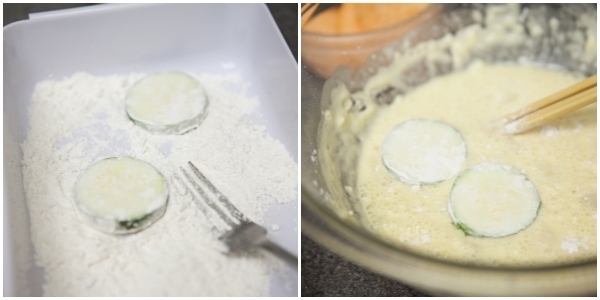 First get the veggies into some cake flour and then drop them into the batter. And then fry these little puppies! It’s amazing, they only take 2-4 minutes to fry up. Andrew (like how I’m calling him by his first name like I know him?) said if it takes longer than that to cook then you have cut your veggies too thick! I don’t know if I should be saying this but I will anyways, Curtis was giddy like a school girl for tempura. He doesn’t like sushi and LOVES getting tempura when we go to Japanese restaurants. He’s the one who suggested we do chicken too. This recipe is a total keeper! My favorite? The shrimp. Curtis’ favorite — the broccoli. We will be making this again and soon! I didn’t make Andrew’s dipping sauce which is more authentic but I plan to try it soon! 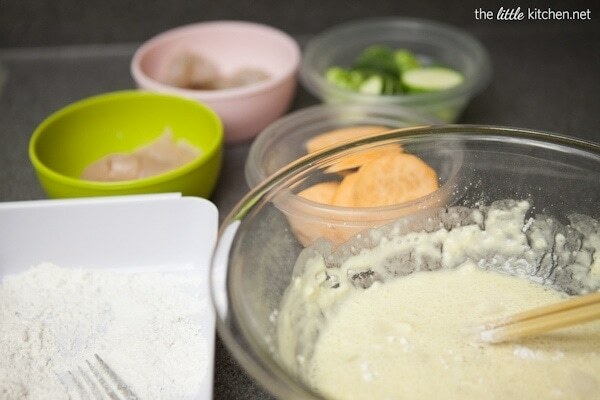 Prep shrimp (Andrew Zimmern's advice is to make 3 shallow nicks or cuts on the bottom of the shrimp and gently flatten or pound the shrimp with the side of a knife to flatten), chicken and vegetables and place them in bowls for easy access when frying. Heat oils in a large pot or French oven to 350 degrees F. Prepare a baking sheet with foil and line with paper towels. Add about 1/2 to 3/4 cup of cake flour to a shallow bowl and set aside. Beat an egg in a measuring cup and add ice and water to make 3/4 to 1 cup. Add to a mixing bowl and add 3/4 cup cake flour. Mix with a pair of chopsticks or a butter knife. Batter will be lumpy, don't over stir. Add a tablespoon or two of club soda and quickly stir. One piece at a time, dip in the dry cake flour in the shallow bowl and then dip into the batter. Remove excess batter by shaking then add to hot oil, being very careful not to burn yourself. Fry about five to eight pieces at a time for about 2 to 4 minutes or until golden and crispy. 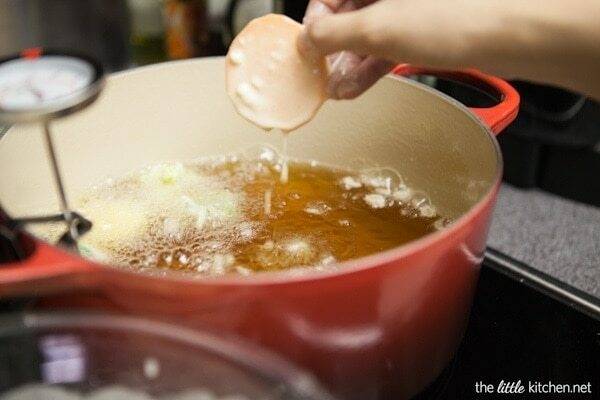 Use a slotted spoon to turn them over when necessary and to remove them from the oil. Place on prepared baking sheet to allow excess oils to be removed. If you need more batter, make it as you need it (so that it remains ice cold for the entire time you're using it). Mix together soy sauce, ginger and green onions. Disclosure: Huge thanks to KitchenAid as I was a guest of theirs at the South Beach Wine & Food Festival. All opinions expressed are always my own. What an awesome event. So glad you got to go. And this tempura – amazing! Wish I had some right now. I LOVE tempura! Especially the veggies. 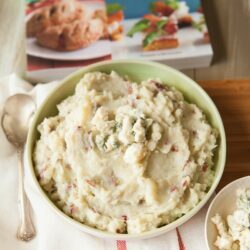 This recipe looks super easy and very doable at home! I can’t wait to try this. Sounds like you had such a great time. I would totally love going to that! What a great event! Tempura is Portuguese…really?! I love to indulge in tempura veggies and shrimp at Japanese restaurants, too. And I’ll always remember my first tempura, when a Japanese exchange student friend made it in our kitchen when I was in high school. It was soooooo fabulous! Yum! I love sushi and tempura is the next best thing! It looks delicious! I have to admit. Fried food at home SCARES me! But you make it look so easy. Come over and hold my hand? We’d be eating out much less. Ps-I’m hoping you’ll teach us how to make shrimp grits soon! I’m kind of enamored with the thought but I have no idea where to start! How fun! I would love to attend a food festival on the beach, that sounds amazing. 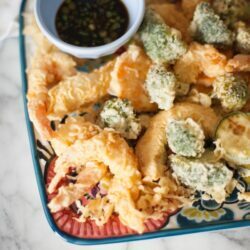 🙂 I’m also a big fan of tempura – I will definitely need to give this a try! Love Tempura.. This looks too good..
this event looks like it was really fun! I can’t wait to try your tempura tips! Oh yum!! This looks perfect. Can’t wait to try it!! Love this recipe and jealous of your time at the festival! Looks so fun! I am a tempura enthusiast, Julie, and your photos are absolutely spectacular! The event looks like such a blast! Ok next year I have to make it to a SOBE Festival, it looks like so much fun… this recipe I am just drooling over it… thanks for sharing! What the!! It’s not Japanese? I don’t care where it originated because I could eat it all day long…yours looks soooo good! Yum! I must try your recipe given that the only way I’ve ever made tempura anything was from a package! I had no idea that the batter is easy to make! I love tempura! One of these days I’m going to go to that festival. It looks ah-mazing! ANDREW ZIMMERN IS MY HEROOO!!!!!! I’d die if i was that close. This looks like it was so much fun! 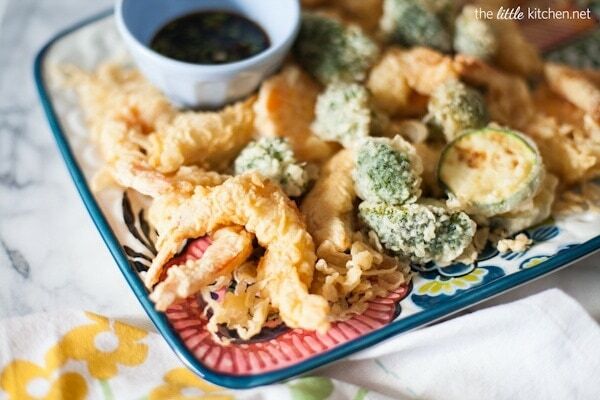 I love good tempura and this looks so yummy! I LOVE TEMPURA! !!!! But I have always been too afraid to make it. I can’t believe how perfect yours looks–just like from a restaurant! I can not wait to one day go to this festival!!! It looks so awesome. Mmmmmmm tempura, so good. This looks amazing Julie! Looks like so much fun 🙂 I love tempura, I need to try this soon! What a fun event to attend. I am going to have to try this recipe very soon. We just got back from Japan a few weeks ago, and tempura was one of our favorite things there! What a fun event! 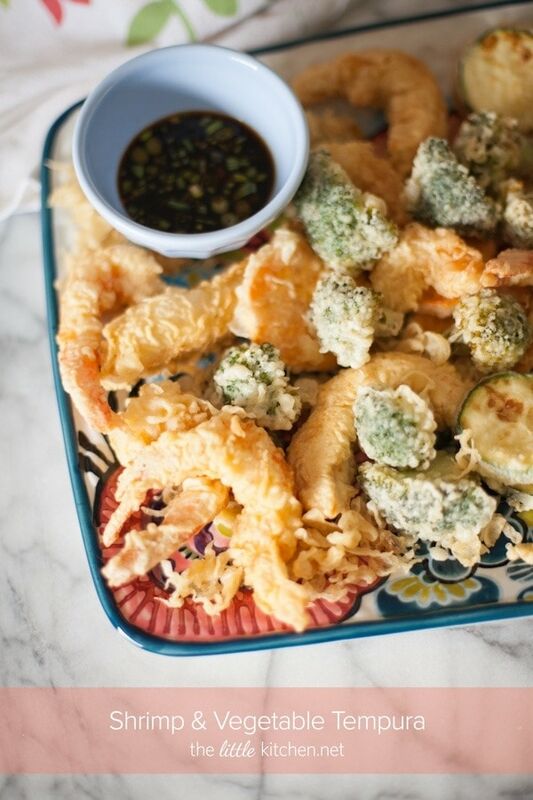 And this tempura – yum! I’ve never made homemade tempera before but I’m sure that will change soon! sweet potato tempura! oh how I love thee. Ice cold is great. The true dipping sauce is mimi and dycon radish. soy is to salty. My mom made this for us after here two trips to japan first in 1970. She cooked while we ate. It is all about the food and the exsperiace. But it was a cheap meal other than the sea food she would cook. green onion .eggplant.sweet potato.broccoli.colliflowr. shrimp just a great meal. 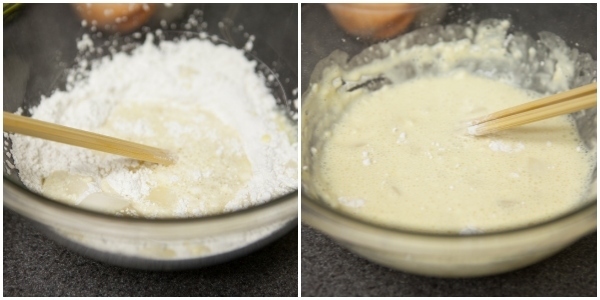 the key is the soda water and the dry drege in ap or bread flour to get the batter to stick. I will eat very little shushi, but always order tempura and veggies. I also have bought the box but quit and always looking for new reciepe’s Love this. Will try it on pay day! !, how do I tag a reciepe of yours, or I will look them up I just like to save. I do not have a printer. Ty I have more of yours to look up!